With their crunchy texture and slightly peppery taste, radishes are a delicious addition to side dishes and salads. They're chock-full of fiber, vitamin C and antioxidants, offering both nutrition and flavor. Compared to other root veggies, they have fewer calories and carbs. A stronger immune system, weight loss and better digestion are just a few of the many health benefits of radishes. If you have gallstones, digestive problems or low blood sugar, avoid eating radishes in large amounts. Moderation is key. Most varieties are available in the spring and summer. White Beauty radishes are snow-white inside and out and have a slightly sweet flavor. Sparkler radishes are red on the outside and white inside and have a distinctive white tip. The Easter Egg radish can be red, pink, purple and white, in one bunch, and boasts a mild flavor. Read more: What Are the Benefits of Spanish Black Radish? Rich in fiber, radish greens are edible and go well in salads, sandwiches, soups and cooked meals. You can even use them as a substitute for parsley and basil in pesto sauce. Add them to omelets, sautéed dishes, pie and more. One cup of radish greens has only 9 calories and provides over 30 percent of the daily recommended intake of vitamin A and 50 percent of the daily recommended allowance of vitamin C.
If you subtract fiber from total carbs, you'll get 2.1 grams of net carbs per cup. This makes radishes ideal for low-carb and ketogenic diets. You can enjoy them at every meal without having to worry about your waistline. Plus, they keep you full for hours. Radish juice is just as nutritious. One serving has 19 calories, 1 gram of protein, 4 grams of carbs and 2 grams of fiber. You'll also get nearly one-third of the daily recommended vitamin C intake. To reap the benefits of radish juice, prepare it at home and drink it right away. Mix it with the juice of apples, beets, carrots, oranges or lemons for an energizing, immunity-boosting drink. These root vegetables have been used as a natural remedy for centuries. Modern research confirms their health benefits. According to a 2018 study published in the Journal of Agricultural and Food Chemistry, Sakurajima Daikon radishes are rich in trigonelline, a bioactive compound that increases nitric oxide production in vascular cells. As a result, it may help protect against vascular diseases. Radishes also contain sulforaphane, a natural compound with anticancer and chemoprotective properties. This substance may induce breast cancer cell death even at relatively low concentrations, according to a 2017 study featured in the journal Phytomedicine. These veggies have also been shown to be effective in the prevention of cholesterol gallstones, which account for a staggering 80 percent of all gallstones. A 2014 review published in Phytotherapy Research indicates that glucosinolates, some of the most abundant antioxidants in black radishes, may lower cholesterol levels in the liver and prevent cholesterol gallstone formation. Furthermore, fermented black radishes exhibit hepatoprotective effects due to their high antioxidant levels. Radishes are over 95 percent water, keeping your skin supple and hydrated. They also boast large doses of vitamin C, which promotes skin health and slows aging. This nutrient stimulates collagen formation and neutralizes oxidative stress, protecting your skin from UV radiation and free radicals. At the same time, it promotes wound healing and may prevent age-related skin deterioration. The B vitamins in radishes contribute to a youthful complexion and glowing skin. Folic acid, for example, scavenges oxidative damage and may reduce the signs of aging, according to Tri-City Medical Center. Vitamin B6 increases the production of "feel-good" hormones and wards off stress, which, in turn, may help prevent acne breakouts and premature aging. Did you know that radishes may protect against diabetes and relieve its symptoms? A 2017 review published in the journal Nutrients states that radishes exhibit antidiabetic properties. These root vegetables enhance your body's natural defenses, improve glucose uptake and help reduce blood sugar levels. According to the 2017 Nutrients review, both radish juice and radishes improve insulin response and glucose metabolism. These veggies contain certain compounds that help regulate insulin, adiponectin and other hormones affecting glucose homeostasis. Catechins, for instance, may enhance the body's ability to produce insulin. Researchers point out that radish seeds and leaves are just as beneficial. However, more studies are needed to confirm their antidiabetic potential. The health advantages of radishes include weight loss and better weight control. These veggies are higher in water and lower in calories than most foods, filling you up quickly. Rich in fiber, they help to suppress appetite and increase satiety. Radishes also have diuretic properties and may help reduce fluid retention. Additionally, they keep your blood sugar levels within normal limits, which may further improve appetite control. When consumed as part of a balanced diet, these vegetables can make weight loss easier. For example, swapping potato chips or trail mixes for radishes can save hundreds of calories a day. Enjoy them as a snack between meals, serve them as a side dish or drink fresh radish juice to quench your thirst and boost your antioxidant intake. Despite their health benefits, radishes may not be safe for everyone. According to WebMD, these veggies can irritate the stomach when consumed in large amounts. Allergic reactions are rare but can happen. Furthermore, radishes exhibit hypoglycemic properties and may cause low blood sugar if you go overboard. The experts at WebMD also note that these vegetables increase bile flow and may trigger pain in those with gallstones. As mentioned earlier, radishes may actually help prevent and dissolve gallstones, so the research is conflicting. To stay safe, eat them in small amounts and see how your body reacts. As with everything else, moderation is key. 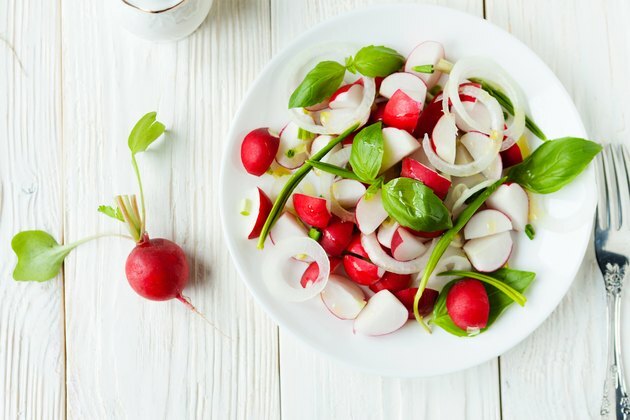 To reap the health benefits of radishes, serve them whole with a pinch of salt or add them to your favorite salads. Another option is to sauté or roast them. If you're craving salsa, toss them with shallots, peppers, cucumbers, jalapenos and lime juice in a medium bowl. Both the radish root and greens are a healthy addition to sandwiches, raw soups, turkey wraps and risotto.